We are back in Ohio and parked at our home church, Dryden Rd. Pentecostal Church in Dayton, Ohio. It is very good to be back and we are anxious for campmeeting to begin tonight! Our exit from New York City went according to plan and I could not be more pleased. We rested Sunday afternoon while we waited for traffic to clear. Taking main city streets to I-295, across the Throgs Neck Bridge to I-95 and across the George Washington Bridge into New Jersey is only about 20 miles. That is not far at all. But at times Sunday evening Google maps had that route figured at nearly two hours with traffic. No thank you! I was not in a hurry so I could afford to wait, sleep and leave at my leisure. It always takes me much longer than Goggle Maps says it will when I am in the bus so the two hours estimate was unacceptable. A little before the 11:00 PM the estimate for the 20 mile ride to the George Washington Bridge was about 30 minutes so we kicked into gear. We cranked the bus and were ready to ride in short order. You may remember that when we came in to the church Tuesday morning we had a difficult time getting around this black car and into the parking lot. I worried all week that when the time came to leave, we would be hemmed in and unable to exit. My Dad suggested we park the Green Machine there when the spot was open. DUH! That is why I call him Dad! Sunday night we pulled up to the exit, Kelly Jo moved the Green Machine out of the problem spot and I pulled the BoggsMobile onto the street. Easy-Peasy! At the second stop sign I hooked up the Green Machine and away we went at about 11:15 PM. We had 5.5 miles of city streets this time before hitting the interstate and that took us 25 minutes. For our future reference with went Central, Linden, Elmont, Hempstead, Jamaica and 212th St. Soon we were paying the $43 toll to cross the Throgs Neck Bridge again and then zooming across. We darted through the Bronx on I-95 and 50 minutes after we left the church we were crossing the George Washington Bridge into New Jersey. As you can see in the picture below, the east bound traffic was crawling. They were backed up for miles! After threading our way through New Jersey the roads were wide open and we drove about 211 miles to a rest area near Loganton, Pennsylvania. We snagged one of the last spots at the rest area and we were in bed by 4:00. Monday's drive of 449 miles across Pennsylvania and through Ohio to Dryden Road was smooth and uneventful just like we like it. We stopped for diesel right after entering Ohio and that was pretty much our only stop of any consequence. That is until we arrived at Golden Corral in north Dayton. I called Bro. 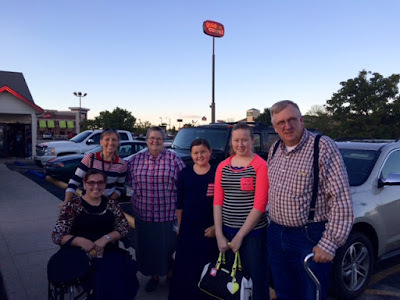 Chris Whiffen to see if they were coming to campmeeting and he was already in Ohio and preparing to go eat. They drove north and met us for a great meal and fellowship at Golden Corral. These have been some of our closest and dearest friends for many, many years and it is always very good to spend time with them. Kailey and Kristen finished the trip to the church in the bus with us. I tried to get them to drive but they both declined. We pulled into the church just before dark, greeted our Pastor and some of the church folks and came inside. It was a long day and we are glad to me "home." The meeting starts tonight. Come be with us.